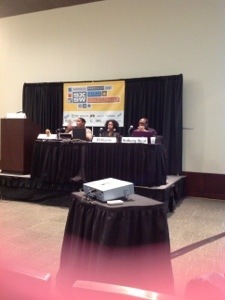 Amazing panel on the phenomena of “Black Tweeting” at the South by Southwest interactive SXSWi festival today. So honored to have heard Prof. Mark Anthony Neal speak on how Twitter revolutionized activism for black people in the modern world. However, with “the revolution”comes “the ratchet”…and so continues the evolution of technology. How do we find balance in the use/ misused of new technology? The debate continues.